Any sight of the word 'Pentium' either makes us think of ugly beige boxes coated in 'Intel Inside' decals, or piping-hot Prescotts with haughty heatsinks. Our collection of processors enter and leave PCs with more frequency than a Dell returns department. Still, we could always be wrong. And this is one such example which proves just that. £499 gets you a lot, despite the chip at the centre of the action representing the budget end of the market, and is based on the now surpassed Core micro-architecture. The E2160 is a relatively new chip, and it's still dual core, with 1MB of shared cache across the cores. Zoostorm's inclusion of Windows Vista Home Premium goes some way to enhancing the package, and runs well here. We're not quite sure who is buying the bottom rung of Vista, but Home Basic users are sure to feel like they're being held back by an elastic band before too long. And unless you specifically want Ultimate, you probably don't know why you'd need it. So it's best to leave this machine as is and settle for the reasonable Home Premium, which includes all the features a PC at that price will need. Once you've shed your preconceptions about the CPU, it's clear this would make a great family PC. While it's clearly aimed as a low-cost starter machine, we're more inclined to place it in a different bracket. With its extra power and other accoutrements, we think the Zoostorm would make an excellent centre for family media use. The latest-gen Nvidia 8600GT may not be range topping, but its 256MB graphics are certainly good enough for the huge majority of games - even if the 3DMark 06 score of 3,844 is distinctly mid-range. So we're not talking top notch figures, but they're certainly better than we thought they'd be from a machine of this price. The Super PI score of nearly 33 minutes is pretty darn good (better than some of the mobile Core 2 Duo systems we've seen) as is the Windows Experience rating of 4.8. That was only restricted by the processor and the memory performance. The 8600GT apparently appeals to Vista a great deal with a 5.9 benchmark for Aero reflecting its DirectX 10 readiness. Gaming graphics were rated as 5.5. As with everything DX10 at this point, though, take such ratings with a pinch of salt. Vista seems aware of the brilliance of this card, but unable to actually get the most out of it. 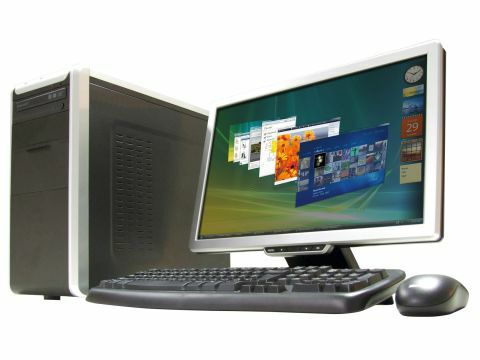 When we first started up our review model, there was a problem with our sound drivers - which Windows Vista sorted out in no time. However, as our computer was brand new, it didn't have the proper Nvidia display drivers installed. That's fine for us as experienced tech heads, we'd have upgraded them immediately anyway - but it isn't great for the end user, who could struggle in setting this up. It's especially galling when you're buying a PC like this, that very clearly isn't aimed at the enthusiast end of the market. Away from performance, expansion won't be too much of a problem, unless you're trying to squeeze an 8800GTX into the box. The motherboard will take twin TV tuners quite ably, for example, if you did want to create a fully-fledged media box from the Zoostorm. You could even opt for an upgrade and add on an Azurewave tuner at the time of purchase. The squat yet smart micro ATX case is nicely-sized and precludes most emitting noise, but you may have a few modifications to perform. It's certainly not quiet enough for living room needs, and despite its tidiness, this isn't going to win any beauty pageants. Thankfully, in terms of connectivity, there are a good number of external ports for connecting kit such as digital cameras, headsets and headphones - seven USB ports are included at various points around the case, for example, a pull-down flap - which feels like it might snap off - reveals a '52 in 1' Flash Card Drive. Exactly which 52 formats it supports is something we'd love to hear. We assume some bright spark has added a hefty number of adapters into that format equation. The specification elsewhere can't really be questioned for the sub-£500 price point, and the hard drive and memory allowances are reasonable and commendable respectively. The 19in display may not be the finest we've seen. The poor Microsoft keyboard and mouse are disappointing. There's a slightly measly warranty. But forgive these minor concessions to price; this is a brilliant machine for the outlay.